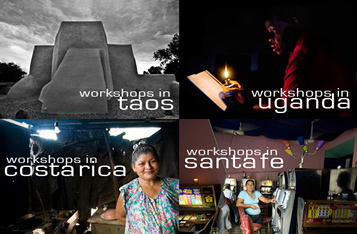 Photography workshops by date, event or location in Santa Fe, Taos, northern New Mexico, Uganda and Around the Globe. Take a photography workshop during your vacation or planned visit, and capture the "Land of Enchantment" within the City Different...and beyond. We also offer individual workshop tours in Santa Fe, Taos and nothern New Mexico. Visit the Santa Fe and Taos Photography Tour pages.